OMG this looks so good, It's not mine, I found it on a blog somewhere and had to copy it for a later date. Credits would be nice but I forgot where I got it from, so if it's you's, let me know I will add it to the post, thank you. Going to give it a try on the weekend. I have to use up the 4 Jap pumpkins I got left from experimenting dehydrating pumpkin, going with butternut instead. 1 package (8 ounces) Cream Cheese, softened – On myfirst attempt the Rancher and I thought there was to much cream cheese frosting for our liking. I decreased the cream cheese to 6 oz. Additional Powdered Sugar to sprinkle on towel. Line a 15-in. x 10-in. x 1-in. baking pan with waxed paper; grease the paper and set aside. Sprinkle a thin, cotton kitchen towel with powdered sugar and set aside. In a small bowl, combine the flour, baking power, baking soda, cinnamon, ginger, and salt. Beat eggs and sugar in a large mixer bowl until thick. Sprinkle with nuts. On my second try I sprinkled the roll with nuts after I frosted it, this is my preference. Bake for 12-15 minutes or until cake springs back when lightly touched. Cool for 5 minutes. Turn cake onto a kitchen towel dusted with confectioners’ sugar. Gently peel off waxed paper. Roll up cake in the towel jelly-roll style, starting with a short side. Cool completely on a wire rack. In a small bowl, beat the cream cheese, 3/4 cup powdered sugar, butter, and vanilla until smooth. 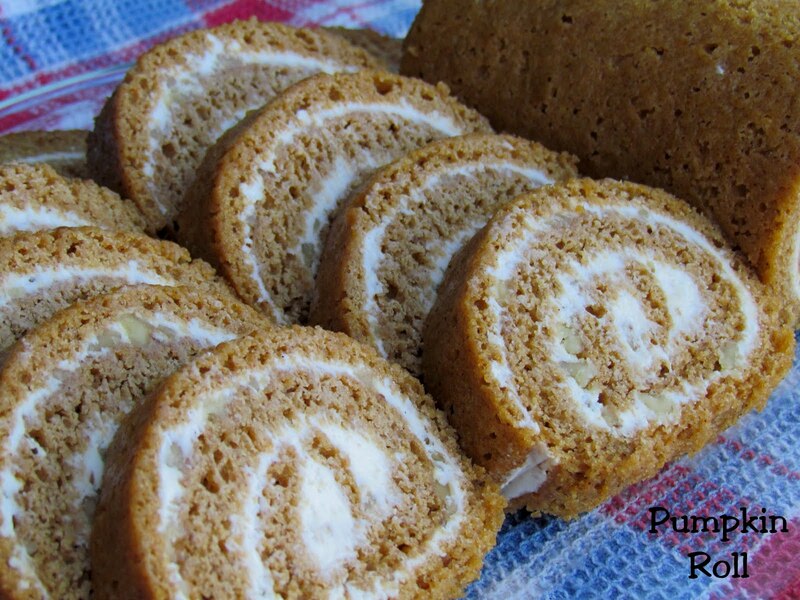 Carefully unroll cake; spread filling evenly. Wrap and refrigerate at least 1 hour. May be frozen for up to 3 months. Remove from the freezer 15 minutes before cutting.